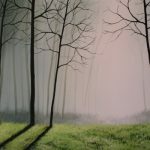 Learn to paint using popular misty forest landscape techniques from start to finish in this fifth installment of my popular 5-part Misty Forest series. All aspects of this painting are covered in this lesson, from the misty forest background to the trees in the foreground to the grass. 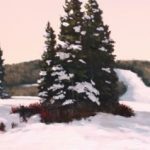 You’ll find a lot of close up shots in this lesson that demonstrate the proper brushstroke techniques to give your painting that consistent, misty forest look.